The big winner emerging from the cloud is Hamas. The mantra of this round was Once And For All. “We must put an end to this (the rockets, Hamas, the Palestinians, the Arabs?) Once and For All!” – this cry from the heart was heard dozens of times daily on TV from the harassed inhabitants of Israel’s battered towns and villages in the South. It did not quite work. Until this round, Hamas had a powerful presence in the Gaza Strip, but practically no international standing. The international face of the Palestinian people was Mahmoud Abbas’ Palestinian National Authority. 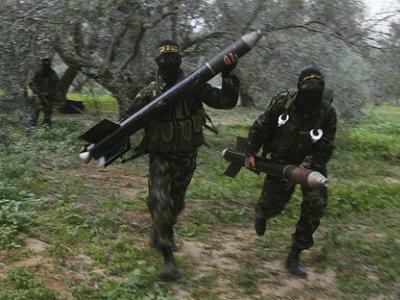 Operation Pillar of Cloud has given the Hamas mini-state in Gaza wide international recognition. (Pillar of Cloud is the official Hebrew name, though the army spokesman decreed that the English name, for foreign consumption, should be Pillar of Defense.) Heads of state and droves of other foreign dignitaries made their pilgrimage to the Strip. In all diplomatic deliberations, Gaza was treated as a de facto state, with a de facto government (Hamas). The Israeli media were no exception. It was clear to Israelis that any deal, to be effective, must be concluded with Hamas. Within the Palestinian people, the standing of Hamas shot sky-high. The Gaza Strip alone, smaller than an average American county, has stood up to the mighty Israeli war machine, one of the largest and most efficient in the world. It has not succumbed. The military outcome will be at best a draw. A draw between tiny Gaza and the powerful Israel means a victory for Gaza. Where does that leave Mahmoud Abbas? Actually, nowhere. For a simple Palestinian, whether in Nablus, Gaza or Beirut, the contrast is glaring. Hamas is courageous, proud, upright, while Fatah is helpless, submissive and despised. Pride and honor play a central role in Arab culture. After more than half a century of humiliation, any Palestinian who stands up against the occupation is the hero of the Arab masses, in and outside the country. Abbas is identified only with the close cooperation of his security forces with the hated Israeli occupation army. And the most important fact: Abbas has nothing to show for it. If Abbas could at least show a major political achievement for his pains, the situation might be different. The Palestinians are a sensible people, and if Abbas had come even one step closer to Palestinian statehood, most Palestinians would probably have said: he may not be glamorous, but he delivers the goods. If at least the US had allowed Abbas to achieve a UN resolution recognizing Palestine as a non-member state, he might have held his own against Hamas. But the Israeli government is determined to prevent this by all available means. Barack Obama’s decision, even after re-election, to block the Palestinian effort is a direct support for Hamas and a slap in the face of the “moderates”. Hillary Clinton’s perfunctory visit to Ramallah this week was seen in this context. Looked at from the outside, this looks like sheer lunacy. Why undermine the “moderates” who want and are able to make peace? Why elevate the “extremists”, who are opposed to peace? The answer is openly expressed by Avigdor Lieberman, now Netanyahu’s official political No. 2: he wants to destroy Abbas in order to annex the West Bank and clear the way for the settlers. After Hamas, the big winner is Mohamed Morsi. This is an almost incredible tale. When Morsi was elected as the president of Egypt, official Israel was in hysteria. How terrible! The Islamist extremists have taken over the most important Arab country! Our peace treaty with our largest neighbor is going down the drain! US reactions were almost the same. And now – less than four months later – we hang on every word Morsi utters. He is the man who has put an end to the mutual killing and destruction! He is the great peacemaker! He is the only person who can mediate between Israel and Hamas! He must guarantee the cease-fire agreement! Can it be? Can this be the same Morsi? The same Muslim Brotherhood? The 61 year old Morsi (the full name is Mohamed Morsi Isa al-Ayyad. Isa being the Arab form of Jesus, who is regarded in Islam as a prophet) is a complete novice on the world stage. Yet at this moment, all the world’s leaders rely on him. When I wholeheartedly welcomed the Arab Spring, I had people like him in mind. Now almost all the Israeli commentators, ex-generals and politicians, who uttered dire warnings at the time, are lauding his success in achieving a cease-fire. Throughout the operation I did what I always do in such situations: I switched constantly between Israeli TV and Aljazeera. Sometimes, when my thoughts wander, I am unsure for a moment which of the two I am looking at. Women weeping, wounded being carried away, homes in shambles, children’s shoes strewn around, families packing and fleeing. Here and there. Mirror images. Though, of course, Palestinian casualties were 30 times higher than the Israeli ones – partly because of the incredible success of the Iron Dome interception missiles and home shelters, while the Palestinians were practically defenseless. All the suffering, the killed, the injured, the destruction, the hours and days of terror, the children in trauma? And, I might add, the endless TV coverage around the clock, with legions of ex-generals appearing on the screen and declaiming the message sheet of the prime minister’s office. And the blood-curdling threats of politicians and other nincompoops, including the son of Ariel Sharon, who proposed flattening neighborhoods in Gaza City, or even better, the whole Strip. Now that it is over, we are almost exactly where we were before. The operation, commonly referred to in Israel as “another round”, was indeed round – leading nowhere than to where it started. Hamas will be firmly in control of the Gaza Strip, if not more firmly. The Gazans will hate Israel even more than before. Many of the inhabitants of the West Bank, who throughout the war came out in their thousands in demonstrations for Hamas, will vote in even greater numbers for Hamas in the next elections. Israeli voters will vote in two months as they intended to vote anyhow, before the whole thing started. Each of the two sides is now celebrating its great victory. If they organized just one joint celebration, a lot of money could be saved. What are the political conclusions? The most obvious one is: talk with Hamas. Directly. Face to face. The same is now true for Hamas. They are there. They will not go away. It is ridiculous for the Israeli negotiators to sit in one room at the Egyptian intelligence service HQ near Cairo, while the Hamas negotiators sit in another room, just a few meters away, with the courteous Egyptians going to and fro. Concurrently, activate the effort towards peace. Seriously. Save Abbas. As of now, he has no replacement. Give him an immediate victory to balance the Hamas achievements. Vote for the Palestinian application for statehood in the UN General Assembly.
. Pride and honor play a central role in Arab culture. And play a central role in any culture that has not be overtaken by the greed of savage capitalism.